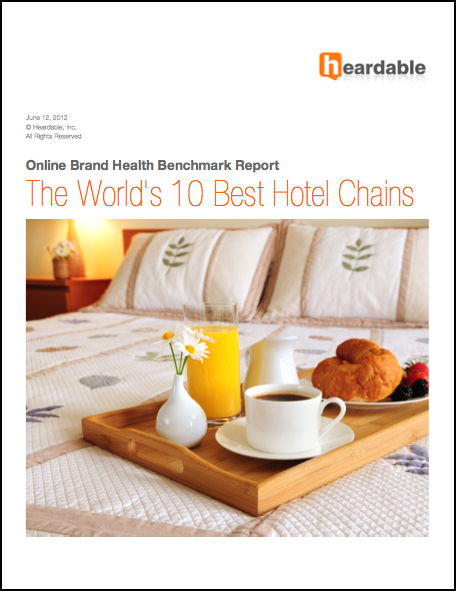 Today Heardable, Inc., (http://heardable.com), the standard for measuring online brand performance, released an all new research report titled, The World's 10 Best Hotel Chains, that benchmarks the online performance of the top 10 hotel chains in the world. Marriott earned the top spot in a field of strong competitors. According to the research, Marriott's brand health score of 706 out of 1,000 possible points beat its nearest competitor, Best Western, by just 4 points, or 0.57%, and surpassed third place Hyatt Hotels and Resorts by 27 points, or 3.82%. The gap between Marriott and lowest-ranked Jumeirah was 105 points, or 14.87%. Sponsored by The International School of Hospitality (http://www.tisoh.com) based out of Las Vegas, Nevada, the research report delves into everything from mobile readiness to social network participation to a brand's adeptness at SEO. To make it into the top 10, over 7,000 individual hotels were examined. Notable brands such as Westin Hotels & Resorts, Crowne Plaza Hotels & Resorts, Inter-Continental Hotels, Radisson, Starwood Hotels and The Four Seasons did not make it into the top 10. "At TISOH, our top hospitality industry faculty takes brand management very seriously, says Timothy M Lam, Executive Director of The International School of Hospitality. "Many of our students are would-be entrepreneurs so we teach the importance of building a robust online strategy to help manage their overall brand vitality. We help them navigate through all the social media networks and show them how to maximize their marketing dollars. After all, no matter how well we prepare our students to become world-class event planners, wedding coordinators, concierge, or hotel operators, if their brand is not at optimal health, then they cannot realize their success potential. It is in this vein that we proudly sponsor this detailed report by Heardable." So how did Marriott rise to the position of category leader? Marriott has succeeded where other hotel brands have failed by making their brand synonymous with quiet luxury. As Bill Marriott puts it in a recent company blog post, "Marriott's personality is a first class experience that lacks pretense, but strives to enhance the guest experience with art, nutrition, culture and overall well-being." The company has also associated itself with some of the world’s leading luxury brands such as Christie’s auction house, Treasury Wine Estates and Aromatherapy Associates, and wellness experts Keri Glassman and Dr. Pamela Peeke – all in an effort to give its guests a luxury experience that speaks to their passions and interests. Heardable is a platform-as-a-service company that fuses math, measurement and marketing best practices into the world's only real-time contextual brand analytics platform that monitors the hundreds of tiny levers through which online brand value is created. Heardable's brand health scores are like credit scores for brands. Scores range from 0 to 1,000. Basically, the higher your score, the better you're doing. Each brand health score is comprised of six subscore categories, each focusing on a unique element of a brand's online effectiveness: Portable, Searchable, Sociable, Measurable, Actionable, and Shareable. To learn more about the report, Heardable's methodology or get insights into other brands, contact marketing(at)heardable(dot)com or call 1-888-520-0034. Heardable is the world's first and only real-time contextual brand analytics platform that measures the online health of brands across hundreds of business categories. With its Growth and Accelerator platform-as-a-service offerings, Heardable helps organizations make smarter, faster business decisions to impact tomorrow's quarterly results. With over 15 million brands profiled and 800 unique online variables capture per brand at various points in time, Heardable's "big brand data" repository can be utilized by any business looking for ways to optimize their online performance, boost brand awareness and increase revenue. Heardable, Inc. is a privately held company based in Temecula, CA with an office in Singapore. The International School of Hospitality is dedicated to helping students enter the industry as well as assisting current employees advance in their careers. Founded in 2004 by professors from the University of Nevada, Las Vegas (UNLV), TISOH offers practical training programs taught by industry professionals and university professors. Courses integrate theory, practice and on-site learning. The school features small classes with personalized guidance; short, intensified programs; and online learning options. Internships, networking opportunities and career counseling are integral components. TISOH is recognized by most leading professional hospitality organizations such as the National Association of Catering Executives (NACE) , the Educational Institute at the American Hotel & Lodging Association and Les Clefs d’Or USA.